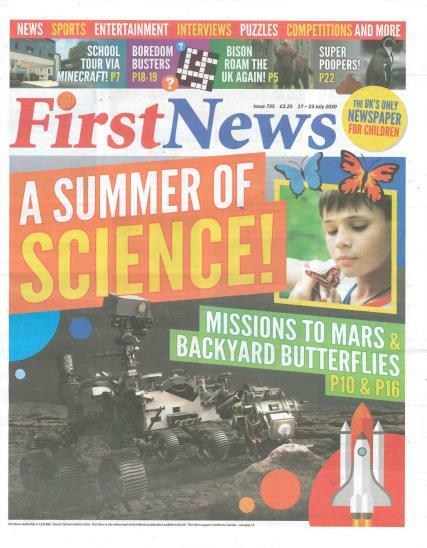 A subscription to First News is a must-have for children aged 7-14. Buy a single copy or subscription to First News magazine. The award-winning weekly newspaper is produced in a traditional, full colour, tabloid newspaper format, First News opens children’s minds to the issues of today, informing, entertaining and stimulating them to take an active interest in the world around them. In 24 fun and vibrant pages, First News features a blend of stories about world and home affairs, the environment, sports, entertainment and puzzles - all selected to engage young minds. It’s fun design brings the stories to life, and competitions and a sprinkling of celebrities hold the reader’s attention from cover to cover. Nowhere else can you find all the important stories in an easy and digestible format, in a voice aimed at inquisitive children – the very children who in turn will grow up to be the country’s great communicators.